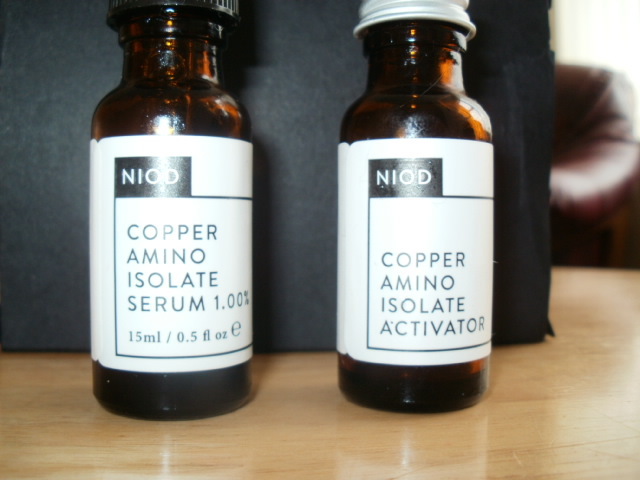 NIOD Copper Amino Isolate Serum 1% .. Truly Remarkable Skincare! If you have not heard of Brandon Truaxe Or NIOD (non evasive options in dermal science) then you should really go to Victoria Health and read up on the incredible things he is doing in the Beauty world! He is revolutionising the way we look at beauty and skin-care and completely turning it on his head. How he thinks and looks at what our skin needs is so much more pioneering and streets ahead of the usual huge beauty giants churning out the same sort of creams which are only slightly different down through their various channels. 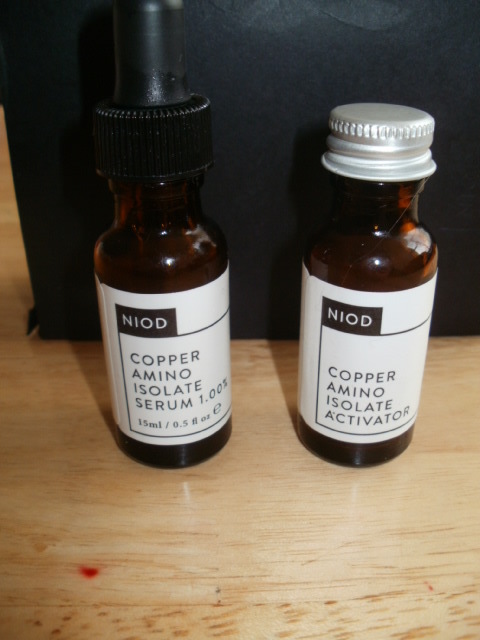 So the first product I purchased was the NIOD Copper Amino Isolate Serum. It comes beautifully packaged in plain black boxes and white labels, slightly clinical, clean and a feeling of something that you feel is going to be high-tech and that is exactly what it is. Two bottles come with this product…. one looks empty .. do not turn it on it’s head and shake because it contains the copper powder needed to make up the serum. You activate this yourself by mixing the Activator and the copper flakes together and shaking for about 30 seconds to mix well and activate your serum. This way you get the freshest product that will stay active for you for the longest time. You keep this serum in the fridge to keep the ingredients as active and as potent as possible. 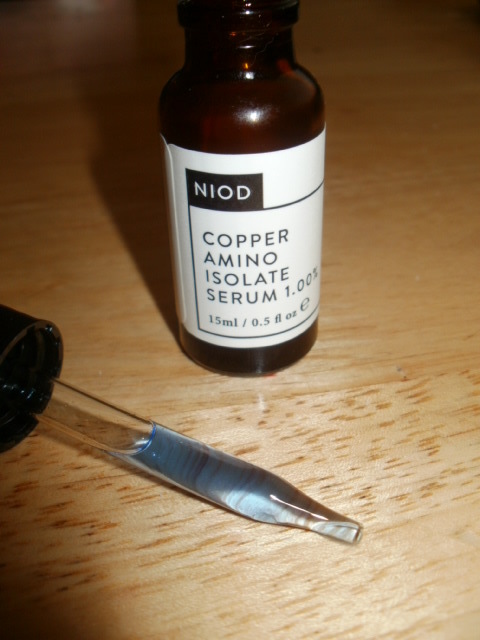 How this serum works is to help reduce all visable signs of anti-ageing. It is absorbed into the skin immediately and it forms a base to make skin look and act younger from it’s lowest depth upwards. So it is also treating the new skin before it gets up to the surface. This is a thin light sky blue serum and I personally find the best way to apply this (as you only need 3 drops) and not over use it is to apply it to the palm of my hand and quickly mix it onto both hands and press it into my skin that is still damp from toning. That way I feel I get a good application of the serum all over my face. On my own skin I have been using about a month now. I can see a more youthful appearance and it has been remarked upon! I feel my face looks and feels healthy (I tend to be quite ashen) my pores do look smaller and firmness and elasticity is much much better. Particularly the elasticity and spring back. I could try and go into all the high-tech stuff about this serum. It is called skin-care for the hyper-educated. I am not quite in that niche but I love good skincare that works and that really matters to me and this really works! I know this because I can see and feel it every day. I use it with the NIOD Multi-Molecular Hyaluronic Complex with 12 different hyaluronic compounds to visably hydrate hydrate the skin. 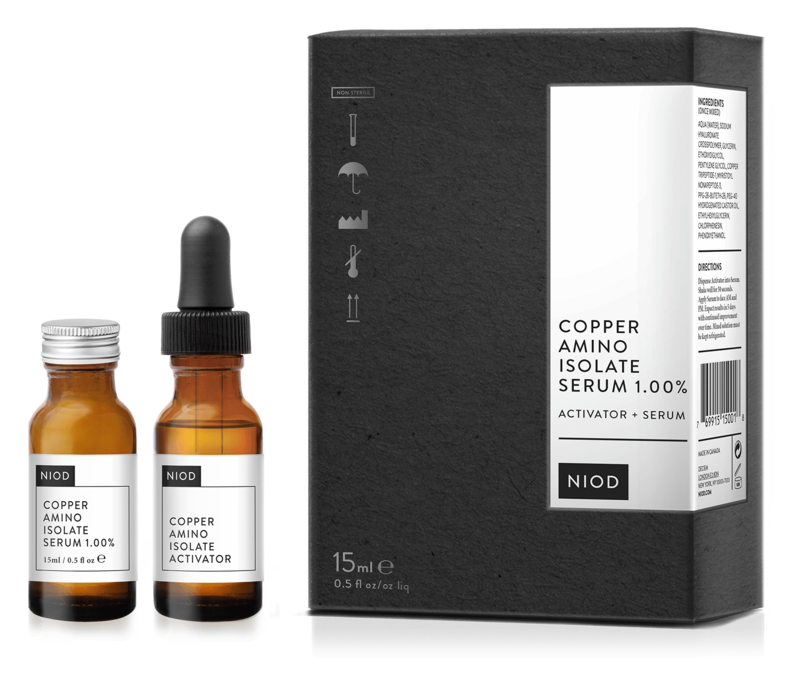 This is a godsend for anyone who struggles with keeping their skin hydrated as they get older as i know I do ..
Having tried quite a few NIOD products now and I can honestly say I just want more and more…. there is no heaviness with these products. They are lovely and light, the delivery goes instantly into the skin. There is no waiting for anything to sink in. You apply and straight away your done and you have intelligent products that is making your skin work for you! The NIOD umbrella is a very fast growing one. People are really waking up to what these powerful products can do for their skin. The amazing Nikki Taylor is a massive NIOD fan and I have to say I have very cheerfully followed her down this line and been really excited by all the new releases and I just cannot wait to get my hands on them! Have you had the pleasure of trying some of the NIOD products yet? If so are you loving them as much as me? This entry was posted in Beauty, Cosmetic, Cosmetics, Ground breaking, Health and Beauty, Pioneering, Skincare and tagged beauty, Deciem, Nikki Taylor, NIOD Copper Isolate Serum 1%, NIOD Multi_Molecular Hyaluronic Complex, NOID, non evasive options in dermal science, revolutionising, serum, skincare, Victoria Health on September 11, 2015 by the40somethingbeautyblogger. Thanks for such an informative review. I wasn’t quite sure what it was all about! I love the hand cream from the range. There is so much science behind the products, it can take a while to get your head around. But once you see and feel them working there is no doubt how good they are! I love the fact you activate this yourself! This looks like such a fab product & I love serums! Will definitely check this out!